Last week my mom, my sister, and I headed to Gloucester, Massachusetts to spend a few days together. Up here in Vermont the leaves are changing, the air is damp and chilly, and the first snow is really not that far away. When I got into “Glosta” it was the complete opposite – a bubble of summer had settled over the area with sunny skies and temperatures in the 80′s. We decided to take advantage and go for a whale watch. I’d been out on a whale watching tour before in the same area when I was in 7th grade. The boat was packed with taller, pushier people and I barely got a glimpse of the few humpbacks that we saw. This experience was different. There were far fewer people on this boat and the wildlife was much more plentiful. Before we really even got going a pair of harbor porpoises flitted by. Shy creatures, they are apparently not often seen in the area, but I was able to get a steady shot before they were out of range. Before we even got out to real open sea, where the feeding grounds are, we saw several humpbacks. Some came up for a few breaths of air, then they were on their way. One individual was resting near the surface. We were able to get quite close as he “logged”, or floated. As this whale began to wake up and ark back into the water I was able to get some very nice close ups. My mom and sister were smiles all the time. 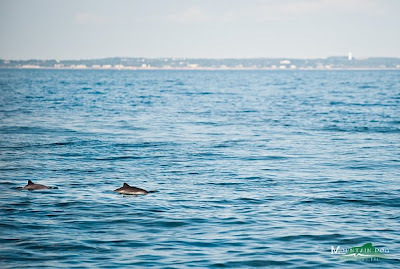 My mom had never been on the ocean, much less seen these great creatures. She was absolutely tickled that we were able to get so close. Since many of these humpbacks have grown up in the company of boats they are quite comfortable to be around them. One of the highlights of the watch was coming across a mother and calf. The calf swam beside her most of the time, following her movements. It didn’t dive as deeply as she did, so it made many more appearances. 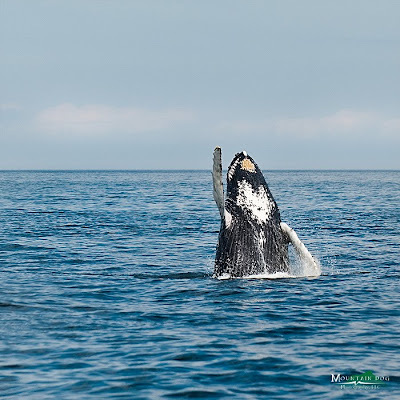 It even showed us some humpback antics, pushing out of the water and falling onto its back, swimming on its side with one pectoral fin out of the water, and doing a sort of hand stand with its tail sticking right up out of the water. As we motored along, deeper out to sea, the real action started. There, in the great blue drink, were 7 humpbacks, all feeding. There are times when I have to just put my camera down and watch. There was no way to photograph 7 humpbacks in one scene, it just wouldn’t come out. I’d be forever explaining that “those specks are whales!”. I had the same experience in Maine while photographing moose. When the 6th moose walked into the pond, I just had to watch. 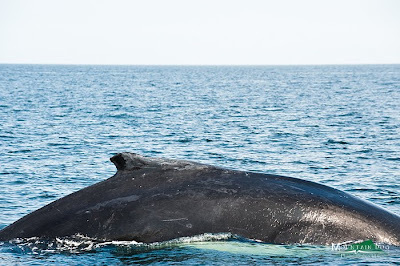 The photographs can’t remember the salty smell or the dampness of our skin after a whale popped to the surface and exhaled alongside the boat. I’ll file those memories away for myself. Letting the camera hang from my shoulder for a few minutes let me really watch the behavior of the whales, not just react to it with buttons and glass. When they surface the first thing you see is the spout and their blow hole, then their dorsal fin. If it is just staying near the surface the whale will slip back into the water without much effort. If its going for a long dive it will start arching into the water just before it brings its tail out of the water. The humpbacks off the east coast have another way of catching fish though. They have learned to slap their tails into the water then spiral down and blow bubbles, thus bunching schools of fish into a smaller area. We were fortunate to witness this behavior at close distance. When humpbacks normally dive they really don’t disturb the water very much. When they go into their bubble feeding behavior though they pummel the surface, sending a huge spray of water up in a violent twist. It’s been a while since I’ve been able to get out for some wildlife photography. When I went to Gloucester I was expecting a few relaxing days of girl time. I never expected to come back with a great set of images from the Atlantic! While photographing domestic animals gives me great satisfaction and many laughs, it is the wildlife that literally makes me forget to breathe.